Here’s a recipe I only decided to document about half way through the process. I realized I was making something more incredible than usual, and I was only able to grab a couple pictures of my delicious concoction before I scarfed it all up. 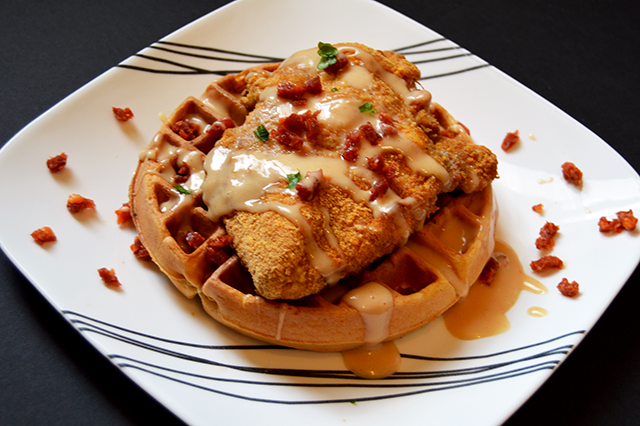 Chicken Waffles. With Maple Sriracha Aioli. For one. Just let that sink in for a moment. Since my boyfriend recently left for a month to go work nights in a power plant, I’ve been looking for easy ways to cook for myself, and myself alone. 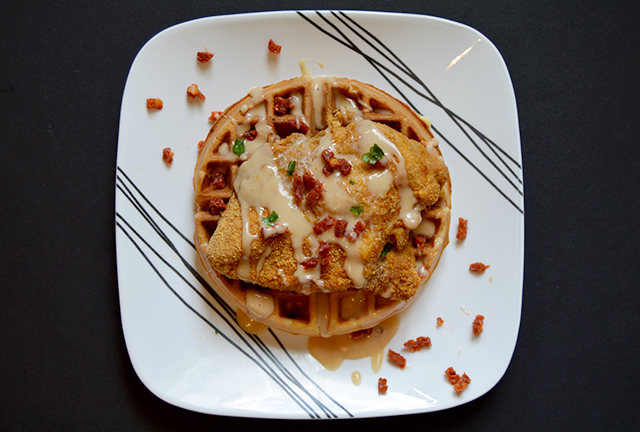 And I’ve been oddly craving chicken waffles for several days now, so I thought it was immensely appropriate to find the perfect recipe for one. 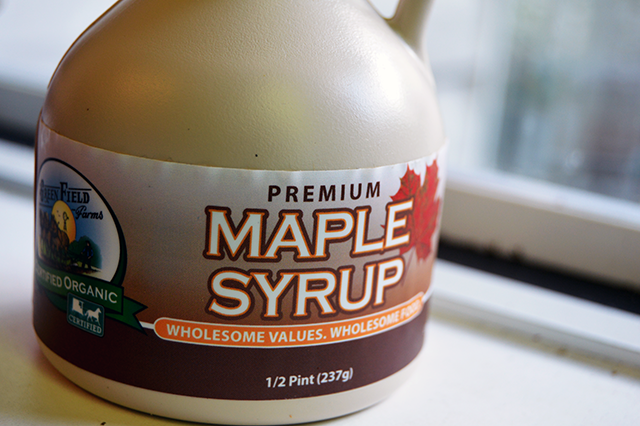 When it comes to the ingredients for your aioli, be sure to use some REAL maple syrup, not some imitation or sugar free imposter. For the aioli, I’ll admit here I cheated, but just a little! Aioli, for those who don’t know, is essentially just a fancy mayonnaise. The real difference being the process in which each recipe is made – where mayo is more of an emulsion and aioli starts with a mortar and pestle. 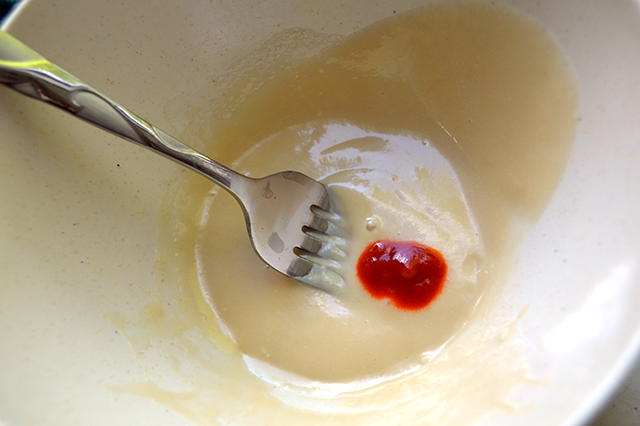 Aioli is also more traditionally served in French cuisine as a dip, rather than a spread. If you really want to make an authentic aioli, all you really need is garlic, egg yolk, lemon juice, Dijon mustard, olive oil, and vegetable oil, and a good recipe. To skip the hard parts of making an aioli, however, you can just use 2 tablespoons of mayonnaise as a base. So really, this is more of a “fakeoli.” Just combine the aioli ingredients together and add the Sriracha to your spiciness liking. Pound the chicken breast to approximately ½ inch – ¾ inch in thickness, to quicken the cooking process, especially if it’s a particularly thick chicken breast. Cover with whatever breading you choose, then pop into the oven at 375*F (or whatever temp the recipe you are using calls for). When it comes to breading the chicken, feel free to use your favorite breading recipe! For mine, I used Shake ‘n’ Bake Chicken – for no other reason that it’s the fastest thing I could find in my cabinets and I was super hungry, so no time for homemade breading! If you frequently visit my blog, you’ll know I’m very much about doing everything from scratch as often as I can (as long as it’s affordable!) so don’t worry, I feel the same twinge of guilt of not doing it the ‘proper’ way. But honestly, if you’re like me and on your own for the next month, you aren’t really going to care if your chicken’s breading is homemade or not, am I right? Cover with whatever breading you choose, then pop into the oven at 375*F (or whatever temp the recipe you are using calls for). 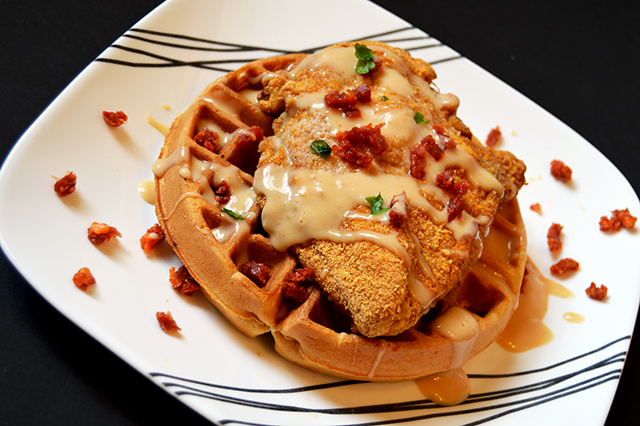 Regardless of what you pour over the top of this chicken waffle, you will end your meal with a happy belly. Preheat oven to 375*F. Pound the chicken breast to ½ inch to ¾ inch thick. Add to a bag with the breading mix, shake to coat, then place onto a greased pan and place into the oven to cook for 20-25 minutes or until the juices run clear. In a small bowl, mix together the mayonnaise, maple syrup, garlic power, lemon juice, Dijon mustard, and Sriracha. Set aside to chill while you prepare the waffles. 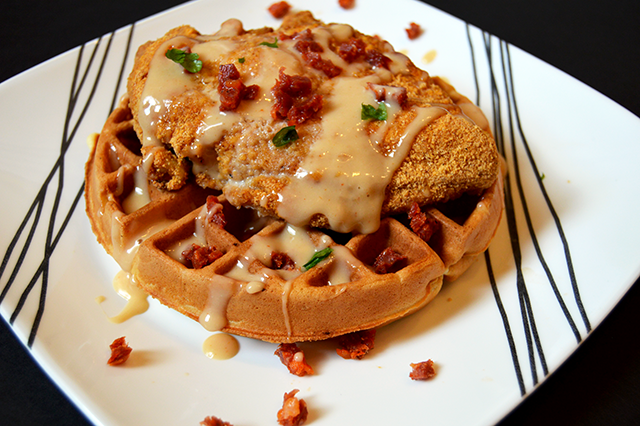 With about 10 minutes left on the chicken, preheat your waffle iron. In a large bowl, mix together the flour, sugar, baking soda, and salt. Pour waffle batter into preheated iron, and cook according to the iron’s instructions. Remove to plate. When the chicken is done, place it on top of the waffle, then sprinkle on the chorizo and parsley. Serve immediately and enjoy!